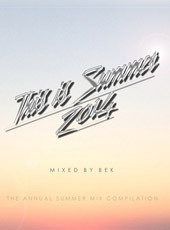 Even if Summer is entering its final phase, we still want to share this year’s “THIS IS SUMMER” mix, as always put together by none other than our own DJ Bek. As you might remember from last year, this mix series is loaded with perfect Summer tunes situated between Beach- and Deep-House – and it’s not just mixed in a traditional fashion, it’s been meticulously arranged and pieced together! Overall a great selection of tunes, that works perfectly while enjoying sunshine, cocktails and/or being on the beach, as long as the outdoor temperature is just right. You can get the mix as a free download on Soundcloud! You can find the mix at this link – and also embedded at the bottom of this page. We from the EF headquarters can only say: both thumbs up, already looking forward to the next one in 2015!